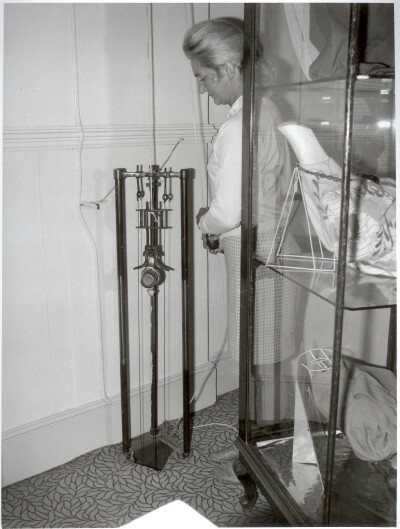 Cash lifts consisted of a car running vertically between two steel guide wires that could be raised by pulling on a cord and descended under gravity. The pulley arrangement meant that the handle had only to be pulled through a quarter of the distance of travel of the car. They allowed a counter to be served above or below the floor or balcony of the cash office and could operate easily over a height of 25 feet. An automatic catch at the top secured the car and was released by pulling the cord. Springs at the bottom arrested the descent. 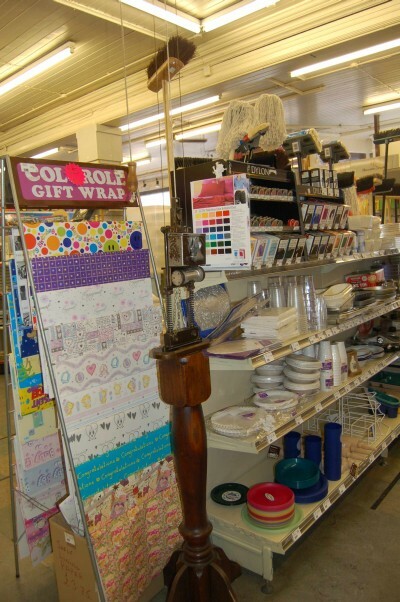 There is a cash lift still in use at Coads store in Ipswich. This illustration (from a Lamson brochure of ca. 1917) shows two designs of car: one with a wire basket for papers or small goods and one with a leather telescopic purse for cash and vouchers. A lift still in its original position and in working order at John & J.H. Sands Ltd., 58 High Street, Kinross. The carrier is like a pnematic tube carrier and has LAMSON stamped on it. 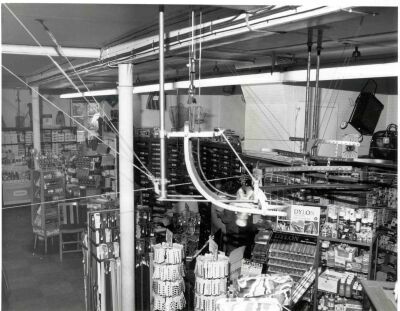 It was in operation from about 1920 to 1988 connecting the cash office downstairs with the sales area upstairs. There may be only two still existing in the UK. The Gipe carrier at Anscombe's, Harpenden travelled upstairs using this curve. I'm not sure whether the Gipe propulsion sent the car all the way up to the first floor or whether the vertical part was more like a cash lift - see the next photograph. The downward journey took the car all the way to the cash office - see Meadows' article. Anscombe's also had a Rapid Wire system on the ground floor. The shop closed in 1981. The upper station of at Anscombe's. The car seems to be the cylindrical cup in a horizontal position with arms which presumably guided it round the curve shown in the left photograph.